The main list shows a summary of all your shipments and counts down the days. Select a delivery for more information, and see where it is on a map. If you like you can view the shipping company’s web page, or easily share your shipment over email, iMessage, or AirDrop. 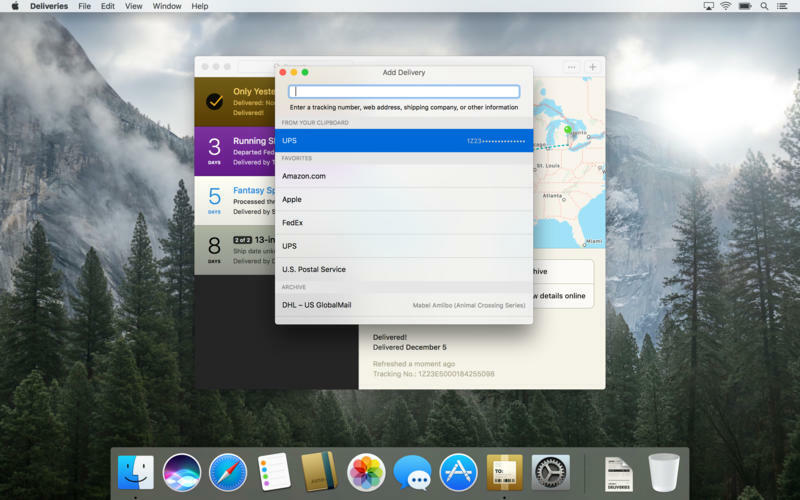 Deliveries can even add estimated delivery dates to your calendar, and a Notification Center widget lets you quickly check your packages without opening the app. All your old deliveries are archived so you can look them up again if you need to. Deliveries is also available for iOS, in a Universal app that supports iPhone and iPad. You can sync your deliveries between devices with iCloud or our own Junecloud sync. If you create a Junecloud account, you can add new shipments from any web browser. - Improved Touch Bar support. Opening the menu bar icon now shows an add button, the escape key now changes to a custom cancel or close button when it's appropriate, and some other minor adjustments. - Improved suggestions when adding a delivery, particularly if you're using the "Add to Deliveries" extension. Some incorrect suggestions will no longer appear, and better results appear higher in the list. You'll also always see an "Other" option at the end if you're adding a URL that Deliveries doesn't recognize. - Entering an Amazon Logistics tracking number will now show "Amazon - by tracking link" as a suggestion. It's not possible to track these shipments using the number alone, so you'll need to paste in the address of the "Track Package" page. - When you add an "Amazon - by tracking link" shipment there's now some text at the bottom of the screen explaining what you need to enter. "Other" deliveries now include some helpful text as well. - When you sign in to a service, you'll be asked if you'd like to save your password, so it can be filled in automatically next time. - If the menu bar icon is enabled, and you have a "Show Deliveries" shortcut set, that will now open the menu bar list instead of launching the main app. - If you try to save a delivery and a required field is empty, Deliveries will automatically change the keyboard focus to that field. - The Add Delivery window now animates when it changes size. It's very nice. - Checkmarks in notifications are back to their normal style on macOS 10.12.4 or later. - Improved the appearance of the "you do not have any deliveries" text in the menu bar popover when it's over a dark background. - Updated for changes to Poste.it. - Improved tracking number detection for DHL Germany and TNT. - Improved flexibility of country code entry for PostNL. It can now be before the postal code, after it, or even by itself if a postal code isn't required. - Improved URL detection for certain web sites like internationalparceltracking.com and poste.it. - Improved mapping for some services. - Deliveries will now notice if the app is updated or moved to a different folder, and let you know that it needs to be restarted. In some cases this all happens automatically, but when that's not possible this change will ensure that everything keeps working as expected. - Fixed a bug where the correct delivery was not always displayed after using Handoff or opening the app from a URL. - Fixed a bug where a delivery might refresh needlessly before you had a chance to sign in. - Improved security requirements for third-party services. - Fixed several possible crashes, and improved performance a bit.